If you read our previous post about Gothic inspired wallpaper, you know we don't shy away from the dramatic. In keeping with that theme, we offer our vamp inspired custom wallpaper. Vamp can mean different things to different people, with connotations to vampirism, vintage pin-up girls, and back around to goth. One perception of vamp that all agree on is that a woman with vamp style is dark, gorgeous, and gets what she wants. Our custom wallpaper design is the prefect interplay of vamp and film noir. Darkness edges the image of an angel from a Gothic church, which gives the wall mural a smoky, mysterious look. The juxtaposition of our vamp model and the innocent angel is a fun way to keep the wallpaper's theme from getting too dark. The custom wall mural may be tinted for a more emotional response. A red tint over the wallpaper image would have a much more intense presence, while a blue tone would give the mural more of a reserved cool. As vamp style can be interpreted in numerous ways, so can a custom wallpaper's imagery be derived by numerous sources and inspirations. 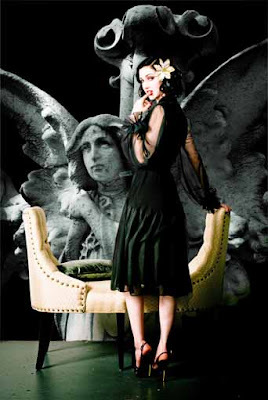 Whatever wall mural image you choose, it will be surely be a perfect addition to a room with a vamp aesthetic.